In the impeachment noise in D.C., many thought the President was bulletproof and would never face impeachment. But facts have finally surfaced that prove that the President committed treasonous acts and definite obstruction of justice. For such acts, impeachment is a certainty. What you are about to read and hear are facts as verified by multiple sources, including government agency operatives and media insiders. This will certainly answer any questions you have. It will certainly anger some and give others a sense of relief. The President’s administration covertly derailed a campaign by the U.S. Drug Enforcement Administration that targeted the Iranian-backed Hezbollah terrorist group in order to quietly protect the Iran nuclear accord, according to an investigative report. According to the report, the campaign, called Project Cassandra, was launched after the Drug Enforcement Administration (DEA) amassed evidence that Hezbollah had transformed itself from a Middle East-focused military and political organization into an international crime syndicate that some investigators believed was collecting $1 billion a year from drug and weapons trafficking, money laundering and other criminal activities. Their terrorist activities long suspected by previous administrations have been exposed and they are real. Government agents working out of a top-secret DEA facility in Chantilly, Virginia, used wiretaps, undercover operations, and informants to map Hezbollah’s illicit networks, with the help of 30 U.S. and foreign security agencies. Hezbollah conducted hundreds of terror attacks against Israeli forces during the 1980s and 1990s and was responsible for the 1983 bombing of a U.S. Marine Corps barracks in Beirut which left 305 people dead, including 241 American servicemen. In 2006 Hezbollah carried out an unprovoked attack on IDF forces inside Israeli territory, killing three soldiers, and taking two captives. The attack sparked a month-long war between Israel and the terror group, which pounded northern Israel with missiles, rockets and mortar fire. Hezbollah has also demonstrated a global reach, aiding the perpetrators of the 1992 suicide bombing of the Israeli embassy in Argentina which killed 29 people, and is widely suspected of carrying out the 1994 bombing of a Jewish center in Buenos Aires, killing 85 people. Hezbollah also funneled weapons to Muslim militias in the Balkans during the breakup of Yugoslavia in the 1990s, and killed six people, including five Israelis, in a bombing attack in Bulgaria in 2012. Since the outbreak of the Syrian civil war, Hezbollah has also operated inside Syria to strengthen the Assad regime, an ally of Iran. After investigators amassed substantial evidence and sought approval for prosecution from the Justice Department and Treasury Department, those two agencies were unresponsive, the report said. Asher added that officials obstructed efforts to apprehend top Hezbollah operatives, including one of Syrian President Bashar Assad’s foremost weapons suppliers. The President entered office promising to take and maintain stiff positions against Iran, saying his policies would inevitably improve relations with Muslim countries as part of a broader and “new” relationship. Ex-Obama officials said they sought to improve relations with Iran as part of a broad strategy to prevent the Islamic Republic from acquiring a nuclear arsenal. Their efforts included the Iran nuclear accords. In a report, sources independent of Project Cassandra confirmed the allegations made by its team members. In essence, this administration’s willingness to envision a new role for Hezbollah in the Middle East, combined with its desire for a negotiated settlement to Iran’s nuclear program, turned into a reluctance to move aggressively against the top Hezbollah operatives, according to Project Cassandra members and others. As a consequence, the report said that the U.S. government “lost insight” into not only Hezbollah’s drug trafficking operation, but other aspects of its vast criminal operations worldwide. Project Cassandra had its origins in a series of investigations launched in the years after the 9/11 attacks (yes, that long ago) which all led, via their own twisted paths, to Hezbollah as a suspected global criminal enterprise. As they pursued their investigations, the DEA agents found that Hezbollah was working urgently to raise cash, and lots of it, to rebuild its south Lebanon stronghold after a 2006 war against Israel had reduced it to rubble. White House spokesman Kevin Lewis denied the allegations by officials from Project Cassandra. I know this is hard for most to believe. How could this exist so quietly? Where has the media been in all this? With the current atmosphere of non-stop leaks everywhere in Washington, how could this horrific information about such corrupt acts committed by any administration not be trumpeted from the rooftops in every city in America? Does this not blow the cover on the corruption that obviously permeates our government? Members of the Administration — the Department of Justice, the State Department, the CIA, and DEA — were all put on task for this job of breaking this $1 billion operation that trafficked weapons, drugs, and money laundering around the Globe, including in the U.S.! Our president has spent much tv time promoting the horrors of the opioid crisis in the nation, how pervasive are drug deaths every week, and how he was aggressively tackling the drug prescription industry’s egregious practice of gouging the American public with their staggering drug prices. Apparently, his words have been a smokescreen. Why would this multi-agency, well-coordinated operation be shut down exactly at the point where the indictments of seventeen high-ranking government officials from Iran, several countries in South America, and even some U.S. citizens were about to be issued? Answer: it has to be about dollars. Most would say: “Presidents are all millionaires. Why would any U.S. President need more?” With the knowledge of the life “after” any presidency will live for life at the expense of U.S. taxpayers makes most Americans shocked that any president would instigate any such actions or allow them to happen on his/her watch. But it did happen. And apparently killing Project Cassandra at the time it was shut down made many in the administration — and apparently the President himself — a pocketful of money. What could be left but impeachment? 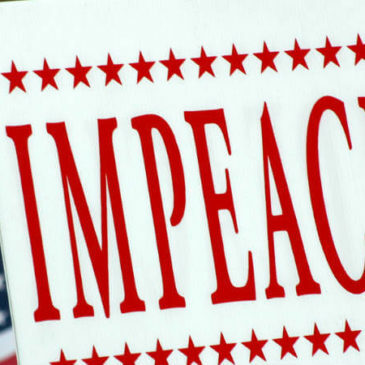 Certainly the President’s taking action to thwart a multi-million dollar investigation is an actual defining example of “high crimes and misdemeanors” — which is necessary Constitutionally to file articles of impeachment against a President in the House of Representatives and an impeachment trial of the President in the Senate. That’s all that’s left here. Folks, this whole story really DID happen. Project Cassandra IS real. And Project Cassandra WAS terminated. And it WAS terminated with the intervention of the President and leaders in the Department of Justice. Dozens and dozens of those who were part of Cassandra for multiple federal agencies have come forward — some confidentially, some openly — and shared the details of the operations and how it was terminated by the Administration with no warning and no explanation other than that explanation given above. There has been a concerted and presidential administration coordinated effort to keep this all quiet. It is obvious why: impeachment for this is inevitable. To put the icing on this entire story, go back and read it or listen to the podcast from the top. Why? None of this happened under President Trump. It all DID happen. But it happened under President Obama! That’s correct. We did NOT hear or see anything about it. We didn’t hear or read anything about it from MSNBC, CNN, The Washington Post or New York Times. We didn’t even hear about it from FOX News. POLITICO did an amazing story chronicling the details. But even POLITICO doesn’t reach everyone. And apparently, no one picked up the story. This all happened while President Obama and Secretary of State John Kerry were giving $100+ Billion to Iran. No criminal actions have been initiated against any of those implicated by the sworn testimony of many regarding the multiple illegal actions taken by many in our government. I’ll close with this: what would be happening right now if Donald Trump or anyone in his administration had initiated, participated in, or allowed anything like this to happen? Realize this: thousands of Americans and citizens of other countries died because of the trafficked drugs and weapons that came out of shutdown of the Cassandra Project. Imagine where we’d be if this happened in the Trump Administration. Sadly, everyone so far from the Obama Administration that committed illegal acts in this has not seen any retribution. And no one involved in Project Cassandra will likely pay any price for their actions. Many if not all of Obama’s cabinet members and intelligence department heads knew about Cassandra, its details, and who was involved. Yet nothing was said or done. And, sadly, if anything ever comes of this regarding their prosecutions, I doubt any will say anything because of deals they have cut. One more thing: Do you think we’d have heard about Project Cassandra if Hillary Clinton was our president today? Sad narrative on the state of America, isn’t it?